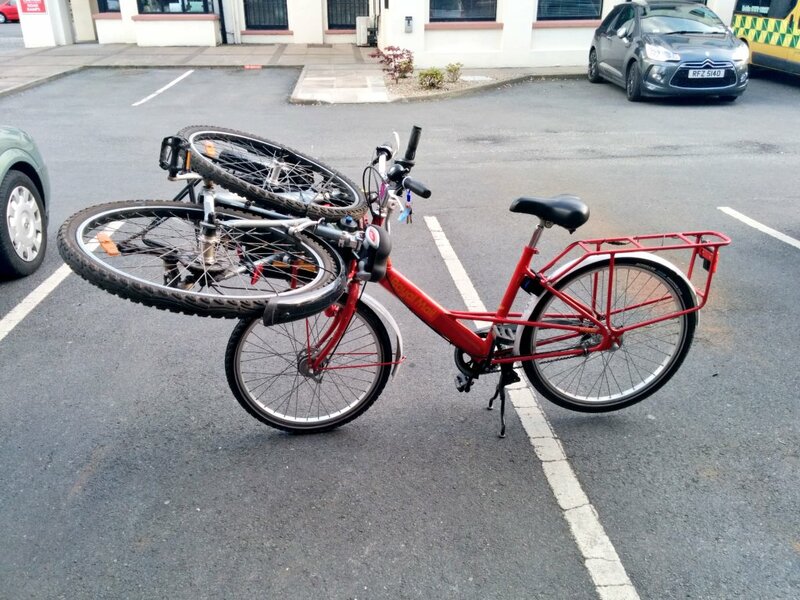 The Department of the Environment in Northern Ireland made great progress into excellent cycle etiquette campaigning earlier this month to outrageous critical acclaim. Their calls for cyclists to slow down, to take responsibility and to shutupandbequiet, while showing examples of exactly what not to do in their excellent video, resonated within the Northern Ireland cycling community and now cyclists are now better behaved than ever before. Of course, the above is nonsense, but I did want to mention the train wreck of an exercise that the DOE underwent to educate rogue #bloodycyclists on my own blog at least once. Jonathan over at NI Greenways has an (as usual) outstanding breakdown of the matters at hand if you’d like some further reading. 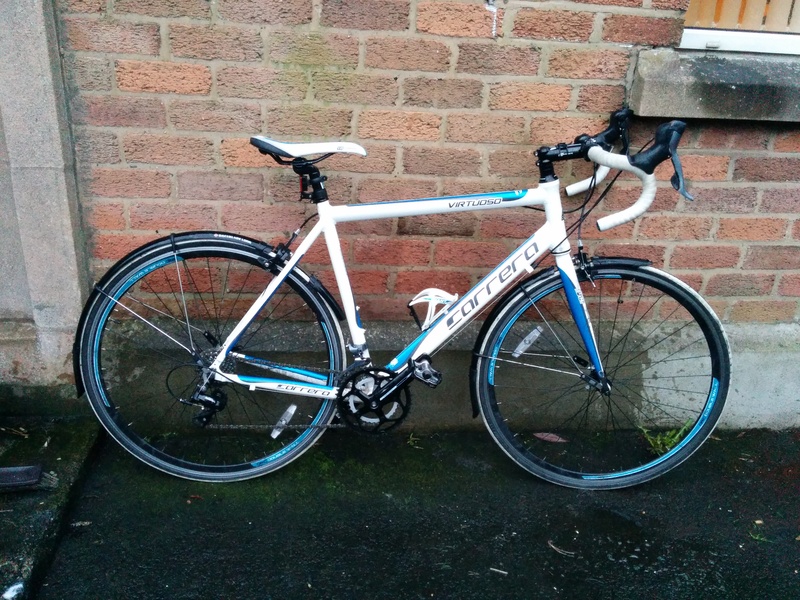 My road bike, which I rode from October 2013 to June 2014. However, my own cycling habits have changed enormously over the past four months. 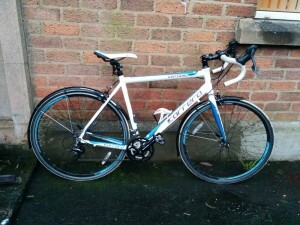 Since October last year, after a long break from cycling due to many reasons, I was on the road again, on a cheap-and-cheerful Carrera Virtuoso 2013, a road bike that I picked up at a very reasonable price. I was really enjoying being behind bars again, and soon replaced the car entirely by March, and to date I undertake just shy of 100% of my journeys by bicycle. My roadie was, although far from high-end, fast and light, weighing in at around 12kg with mudguards, lights and bell attached. I clocked up around 2,500 miles from November (when I picked up a cycle computer in a sale) until the beginning of June, and entirely regained my love for cycling. Traffic was no longer an issue, and my journey times were solid and predictable in all situations. I built up my fitness again after 2 years of a relatively sedentary lifestyle, and my energy levels and health improved. After a few months, I was a cyclist who could easily keep up with urban traffic on most roads and I rode my bike on the roads like a very-low-CC motorcycle. It seemed great. What became irritating, though, was the near-total incapability of my bike to carry cargo. I fitted it with a sturdy rear rack, and usually attached my messenger bag to that, but was getting frustrated that I could only carry around 40 litres of cargo at a stretch, and that weight made the bike quite unstable and unpleasant to ride. On top of that, the bent-over aerodynamic riding position the bicycle encouraged was uncomfortable, and I began developing neck pain from all my time in the saddle. I had developed an interest in cargo bikes a long time prior to buying the Carrera, and I had been going over the possibilities of obtaining one for a few months prior to my cargo frustrations beginning. A long bout of consideration of Workcycles‘ range of transport and cargo bikes had me considering a KR8 bakfiets (box bike), but due to my relatively uncommon need for carrying giant cargo, I wasn’t entirely convinced it would be an ideal everyday replacement. It weighs in at over 35kg with a standard setup, and is pretty tricky to store inside. 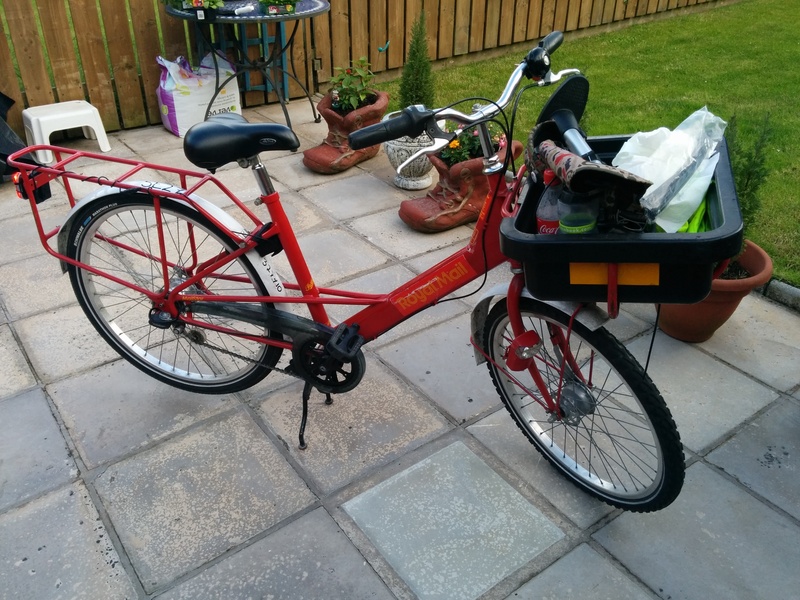 After plenty of drooling over bakfietsen and other expensive cargo bikes, I happened, completely by chance, upon a listing on Gumtree for a “Royal Mail Post Bike”, which was only an hour’s journey away from me if I borrowed a car. I found it out to be a Pashley Mailstar, the bike used since 2003 by Royal Mail in England, Scotland and Wales to deliver post. I had fallen in bike-love. The Mailstar mashes together my love for postal systems and bicycles (sorry if that shatters your idea of Cool Ellen), and it represents a slice of history. At the end of 2013, Royal Mail announced they were replacing the great bulk of their bicycle fleet with diesel vans and golf carts, so the Mailstar is going to be a dying brand. It’s a whole other discussion, but I think this is very short-sighted and irresponsible of Royal Mail, especially given the “age of austerity” we’re in, and the continuously-worsening environmental situation. The Mailstar, awkwardly strapped to the car. 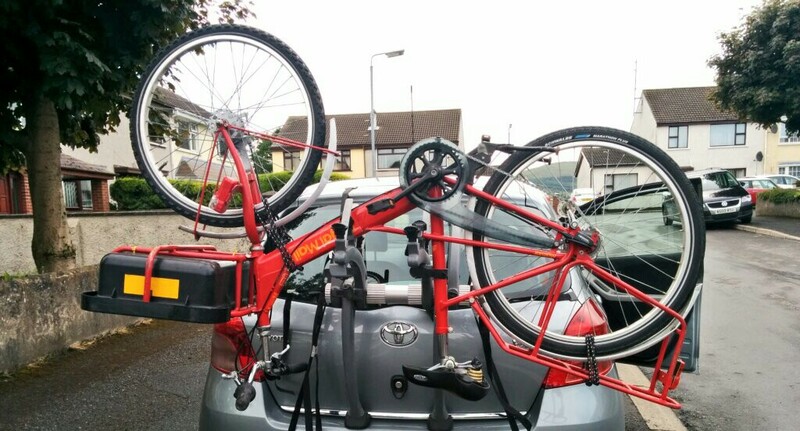 So, I borrowed my father’s car and drove to Newry to see the bike. I was expecting the photos to hide the rust, camera angles to straighten the bent spokes and to take away from the split rubber, but it was in perfect condition. Everything except for the gearing was in great condition, and I knew that would be an easy fix as the hub itself was perfect. So, after a modest sum of money changed hands, I had an upside-down Pashley Mailstar strapped to the back of the hatchback (it’s the only way I could get it on), and we were heading back to Belfast as newlyweds. Postie, the moment I got her home. When I got home, it was a simple case of learning a ton of stuff. This thing had many features I had never had before in a bike, so getting everything set up after 18 months of non-use was a learning curve. A step-through frame, made of steel. A (f***-off big) front rack that doesn’t move with the handlebars. Internal hub gearing. Drum brakes. Two different sizes of wheel, with tubes that had Dunlop valves! Metal fenders, a comfortable saddle, and a total weight of over 26kg. This bike was no plaything. But it was fantastic fun to get going, and an hour or so of tweaking and calibrating had everything going perfectly. Except the hub gears. The twist shifter was the wrong one for the hub, so fixing it took a few weeks because sourcing the part in a shop that would deliver affordably to Belfast proved quite tricky. In the end, though, it was just a plug-and-play of the new twist shifter and it worked like a charm. My first trip on the Mailstar was from my family home to my student house, which was a terrifyingly interesting journey, as it happens. Being stuck in a very low gear combined with an unfamiliar upright seating position and a bike over twice the weight of the one I had ridden just that morning made it a hard-to-forget ride, especially as I had to get used to irritated drivers being stuck behind me when I was just about scraping 10mph. When I got home, I named the bike Postie, and pored over SRAM hub gearing manuals. After locking the hub into the direct drive gear, I had a very effective (if heavy) single-speed bike, which I fell in bike-love with over and over again at every new discovery. 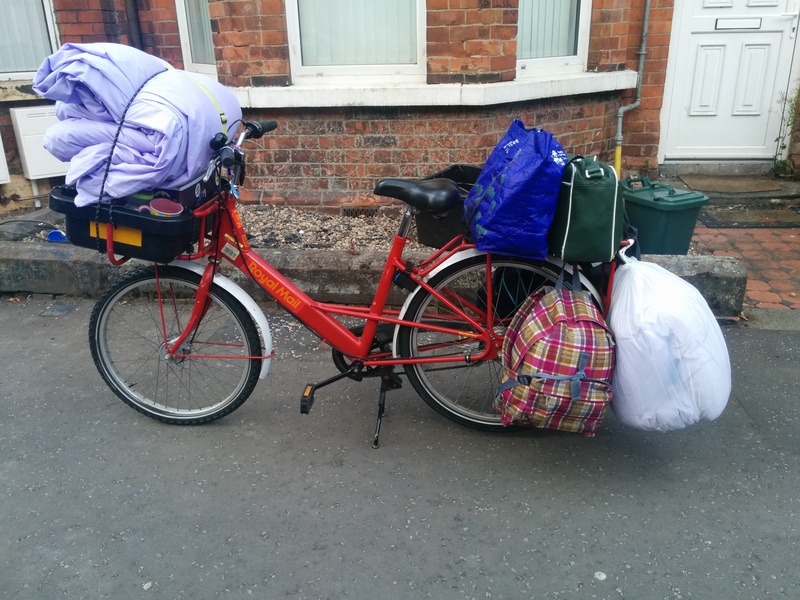 In the first few weeks, I helped my partner move house, I climbed the enormous hill at Parliament Buildings at Stormont for the All Party Group on Cycling meeting, carried my first passenger on the rear rack, and performed my first emergency stop while carrying 70kg of cargo. My average speed had halved, from 16mph on the road bike to around 8mph, but I had never loved cycling more. 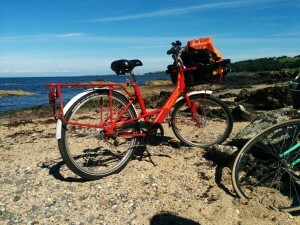 In just a few weeks, Postie had shown me the more relaxed side of cycling, and although I had always shrugged off “pootling along” as silly and useless, being forced to go slowly by the cargo I was carrying forced me to understand why going slowly was so brilliant. I began to find cycling relaxing and enjoyable like I never had before, and I even found my journey planning skills improving as I had to factor in my low speed. What I noticed, though, that the majority of my journeys within the inner city weren’t affected at all by my lower speed. Still being limited by traffic signals and the necessary low speed of filtering through stationary traffic, I was easily matching my road bike speeds on Postie, but the journeys were much more enjoyable because I was comfortable, relaxed and could carry my belongings with me, allowing me to bring everything I need for comfort and utility. 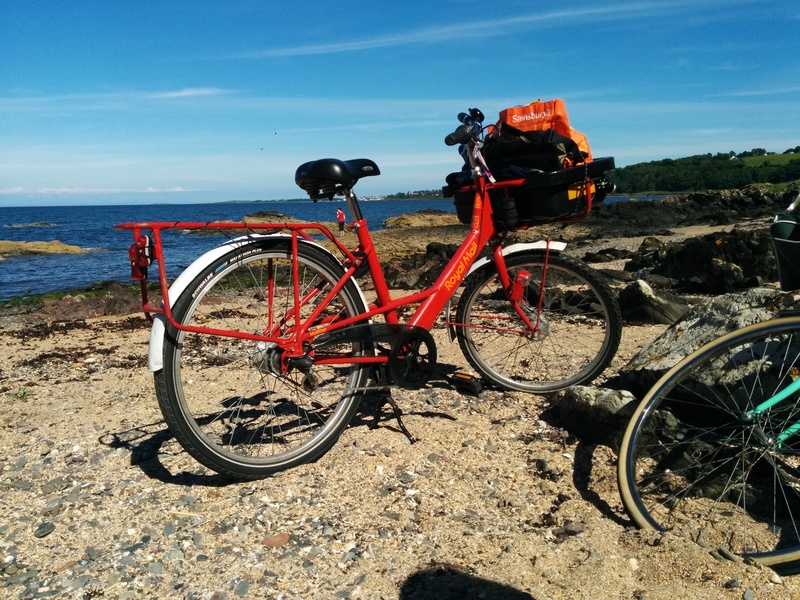 I no longer had to worry about my laptop and bag being too heavy to strap to the bike – I just threw them in Postie’s bucket without a second thought and headed on my way. Since I had accepted going slowly, I was turning up to meetings and events comfortable and cool, and not sweating and out of breath. I also didn’t need to strap my trousers down tightly, and didn’t have to rigorously secure every stray shoelace in fear of my chainset eating them. Since Postie has a good chainguard and a low rear wheel, I could start wearing comfortable and loose clothing without a worry. I cycled in a dress for the first time and felt more free than ever before. Carrying passengers was also a breeze, and after a few test rides on private ground, I was comfortable carrying passengers on public roads. I now just keep some firm foam with a rubber O-ring in the front box in case I need to carry a passenger, because they seem to appreciate something between them and the metal rear rack. Everyone else who has ridden Postie has said the same – she is extremely stable, even with a squirming, unbalanced and clumsy passenger on the back. However, there were problems with going slowly – drivers express their frustration and impatience much more easily now, and I’ve found my subjective safety has been affected quite a bit. I understand the need for high-quality segregated cycle infrastructure much more clearly now that I have a heightened sense of danger on the road. I’m also getting a lot more catcalls while cycling on Postie, which I suppose is unfortunately to be expected. Going slowly and being more “visibly female” by wearing comfortable clothes while cycling makes you more prone to that sort of thing. 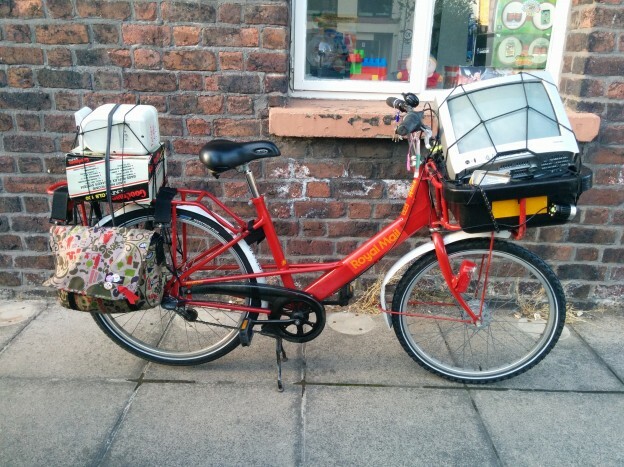 Postie has also become a big talking point with other cyclists on the roads – I get daily questions about how I got her, how heavy she is and how she is on the roads. Though I’m guilty of being one of those weight-worriers with bikes before, trying to keep the weight down as much as possible, my 28kg figure (when I have lights etc mounted) is now an item of pride. The questions can be an issue, though, especially when I’m characteristically late for something and it comes across as rude not to answer questions comprehensively. If you’d like to keep up with Postie’s adventures, I use a standard hashtag on Twitter to document them: #todayWithPostie. You can visit postie.ellenmurray.co.uk for easy access to the posts. If you want to start cycling on a comfortable bike but don’t know where to start, get in touch! Or ask the wonderful local cycling community on Twitter. If you’re a fan of slow cycling, I highly recommend The Slow Bicycle Movement on Facebook. Danny Kennedy’s cycling revolution may be coming along slowly, but I have certainly experienced my own cycling revolution in the meantime. By replacing skinny tyres, dropped handlebars and a saddle like a shard of glass with fat, armoured tyres, an upright riding position and a comfortable seat upon which to pootle along, I’ve rediscovered my childish love for cycling that I had when I was 14, and I couldn’t be happier. I’d encourage you to try the same. Buy a heavy bike, sit upright on it and ride slowly. Wear a dress and float through the streets of Belfast – you’ll not want to go back. Next Post:What’s with the wheelchair?